HELLO AMERICA! A few days ago, I received a message on FACE BOOK from a young actor who resides in Algeria. It turned out that this young 25-year-old knew much about American TV, film history as well as tons of iconic, respected actors of the theatre and film industry. Admittedly, I was shocked and pleasurably surprised, especially when he informed me that he had read my book HOLLYWOOD THROUGH THE BACK DOOR and was totally emerged in the chapter concerning my experience on stage with the great actress when we costarred in her Broadway hit MEMBER OF THE WEDDING. He was anxious to know more about my involvement with the great lady and since I never tire of talking about my dear friend, I was eager to sit back and reveal things I very seldom discuss, especially bits of information relating to her private life and feelings. As many people might know or remember from published items down through the years, I first met Ethel while a student at U.S.C. and during that time, as well, I was a part of the first Black Theatre founded by NICK STEWART, known for his delightful character of “Lightning” on the Amos and Andy TV show. At that time because of the rental restrictions in California, blacks were not permitted to rent in every area of Los Angles. Because of this, no matter how famous you were, there were set areas for those of color, therefore, stars such as Bill “Bojangles” Robinson, Lena Horn, Billy Daniels, Juanita Moore, James Edwards, Sidney Poitier and all the rest of them with the exception of Nat King Cole who challenged the system and was able to purchase a beautiful mansion near Rossmore in Hollywood. However, his family experienced several attacks by the KKK that littered his front lawn with hate placards. When first meeting Ethel Waters, I was appearing in a musical at the Ebony Showcase Theatre. Nick Stewart insisted I meet her and when I did, I was so overwhelmed by the experience, I could barely speak. She smiled and warmly held my hand for a moment and indicated how much she enjoyed our musical “Carnival Island.” Following graduation from U.S.C., I was signed to appear with DAVID WAYNE in “Finnigan’s Rainbow”, a beautiful Broadway show which was quite a hit years before, with WAYNE reprising his star role. The opening took place at the Los Angeles Ambassador Hotel which was quite beautiful and popular down through the years. On closing night, I had a problem with my costume resulting in my private parts being exposed to the audience which, of course, received a gigantic reaction from the audience with applause and laughter which did not fare well with the other actors on stage. 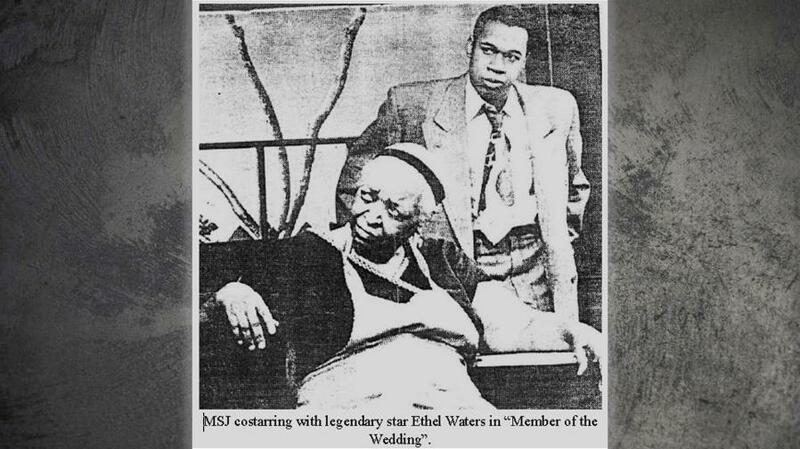 When appearing at the closing after party, Ethel Waters approached me and indicated she would like me to appear with her in her legendary play “Member of the Wedding” but she would not tolerate the kind of shenanigans pulled on the stage that night. “Boy,” she warned, “when you’re on stage with me, you better keep your little peter zipped in your pants! I don’t play!” I looked at her and quietly agreed. A few days later, Ethel called and asked me to come to her home in Pasadena, she would like to get to know me better. Of course, I agreed and the following day, I was knocking on her door. Her maid answered who was Caucasian, directed me to Ethel’s bedroom. When I entered, she was lying on her bed and indicated I should join her. I awkwardly slipped on beside her, got even more comfortable and began to talk about her life and feelings as an actress. She discussed some of the men who had taken advantage of her during her long career, great musicians such as Duke Ellington, Lionel Hampton, dance choreographer Archie Savage, and even expressed lingering anger concerning how MGM allowed LENA HORNE to sing songs in “Cabin in the Sky” a film she felt she would have done better. By the time of our first rehearsal session I felt as if I had a clear picture of Ethel Waters who definitely wasn’t one to be taken for granted.